How Easter became a primary church festival is an example of inculturation—the blending of early New Testament Church and pagan cultures until a new ritual was created. The original Passover service as practiced by Jesus Christ and His early followers was replaced by a festival recalling not His death but His resurrection. At root, Easter is an ancient pagan fertility celebration and nothing to do with the practice of the early Church. The debate over the timing of the new celebration, known eventually as the Quartodeciman Controversy, reverberated across the Roman Empire for almost three centuries. In 325 C.E. the Council of Nicea ruled in favor of Easter, and the Synod of Antioch reinforced it in 341. Though the synod called for the excommunication of any who resisted the new observance and their removal beyond the bounds of the empire, the issue did not go away: those who wanted to follow the early Church’s practice had strong precedent. The term quartodeciman (Latin for “14th”) was applied to those followers of Jesus who honored His death as the early Church had done. They held the memorial on the 14th day of the Hebrew month Nisan, the same date as the Jewish Passover. 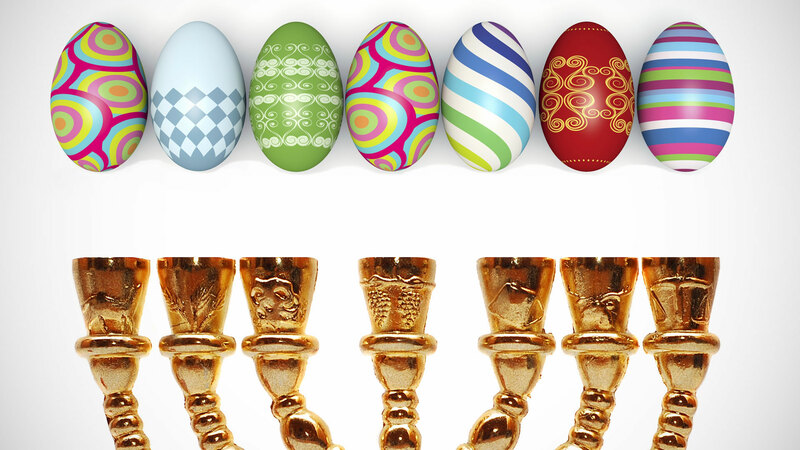 But it was clearly irksome to many that the Jewish dating of Passover was the determinant of the date of Easter. Following the church at Rome, they wanted to celebrate Christ’s resurrection on the Sunday following the first full moon of the new year. According to the Julian Calendar, the year began at the vernal or spring equinox. Thus Easter is always a Friday-Sunday celebration, while the 14th of Nisan may fall on a Monday, Wednesday, Friday or Saturday, but never on a Sunday. The degree of antipathy toward the Jews and the Quartodecimans was expressed forcefully by the emperor Constantine as he heralded the changes established by the Council of Nicea: “It was decreed unworthy to observe that most sacred festival in accordance with the practice of the Jews; having sullied their own hands with a heinous crime, such bloodstained men are as one might expect mentally blind. . . . Let there be nothing in common between you and the detestable mob of Jews! We have received from the Saviour another way; a course is open to our most holy religion that is both lawful and proper. Let us with one accord take up this course, right honourable brothers, and so tear ourselves away from that disgusting complicity. For it is surely quite grotesque for them to be able to boast that we would be incapable of keeping these observances without their instruction” (Eusebius, Life of Constantine 3.18.2–3). It is apparent that Constantine had been grossly misinformed about the origins of Easter. In fact, the simplicity of the emperor’s pronouncement clouded some of the real issues. Thus the controversy that had led to the Council of Nicea continued to be intense for at least the rest of the century. Eusebius of Caesarea, the bishop-chronicler of the council, recorded the testimony of Irenaeus, bishop of Lyon in the late second century, regarding the first pretext for changing the New Testament Passover memorial. Irenaeus stated that the debate had begun in the days of bishop Xystus (Pope Sixtus I, ca. 115–125 C.E. ), from whose time the observance of the 14th was no longer followed in the West (Ecclesiastical History 5.24). In addition Pius, a successor to the bishopric of Rome, claimed in 147 that his brother Hermes had received instruction from an angel commanding that Easter should be observed on “the Lord’s Day” and not on the 14th (Joseph Bingham, The Antiquities of the Christian Church, 1855). So, according to the records of the church of Rome, the celebration of Easter is not based on Jesus’ instruction and teaching but on a purported angelic vision more than 100 years after Christ’s death. That the church in the second century resorted to such claims for the authenticity of its teachings demonstrates its degree of departure from apostolic instruction. Constantine’s ruling also glossed over the fact that the Passover was the memorial of Christ’s death for the Quartodecimans, whereas those advocating Easter were focused principally on His resurrection. Hence, a major theological divide developed between those who aligned with Hebrew tradition and those who did not. Polycarp, a disciple of the apostle John, traveled to Rome to seek harmony between the two schools of thought, but without success. His successor, Polycrates, claimed to be the eighth in a succession of bishops in Asia Minor who had kept the 14th as the memorial of Christ’s death (Ecclesiastical History 5.24). Melito of Sardis (in Asia Minor) was a contemporary of Polycrates. Writing in the late second century, he also contended that the New Testament Passover was to be held on the 14th. In a sermon on the Passover, he went even farther than the historical records we have of Polycarp and Polycrates. He made the connection between the death of Christ as the Passover Lamb and the need for Christians to put leaven (yeast) out of their lives—leaven being a symbol of sin. This echoes Paul’s epistle to the Church of God at Corinth (1 Corinthians 5:7–8). It also shows an understanding of the sequence of festivals outlined in Leviticus and observed by Jews to this day. It highlights the relationship of the Passover to the other festivals—a relationship that was lost by the new focus on the resurrection. Some 50 years after Eusebius and the Council of Nicea, Epiphanius, another church historian, wrote that there were still some in the empire who kept to the 14th despite the emperor’s decree. He listed the groups that claimed to follow Jesus Christ but that he considered heretical. Among them were the Audians, a group that continued to observe Passover at the same time as the Jewish community. Epiphanius recorded their claim that the church had “abandoned the custom of the fathers . . . to suit the emperor” (Panarion 70.9.3). The Audians also related the New Testament Passover to the keeping of the Feast of Unleavened Bread. Constantine apparently banished the group’s leader from the empire. But that did not change the conviction of the people. Not willing to compromise on the matter, the Audians were subsequently legislated against by Emperor Theodosius (379–395), so that followers of this teaching were forbidden to meet and were subjected not only to confiscation of property but to the death penalty. Although the exact geographic location of the Audians is not named by Epiphanius, we do know that the Passover was still being observed on the 14th in Syrian Antioch at least a decade after he wrote. John Chrysostom, bishop of Antioch, left a record of some eight sermons he preached in 386 and 387 against those who thought it appropriate to continue keeping the Passover and other holy days with the Jews in that community, rather than the days established by post-apostolic or imperial edicts. In other words, more than 60 years after the Council of Nicea, the practice of observing the Passover as the apostles had done with Jesus Christ was still being maintained by people who considered themselves faithful followers. For most, however, the festival had changed over a period of several centuries from one that had deep roots in the scriptural Passover to one associated with pagan resurrection myths. Yet there is nothing in either the Old or the New Testament instructing such a change in observance. The concept of crucifixion of the Son of God was, as the apostle Paul stated, difficult for most pagans (1 Corinthians 1:20–25). The sacrificial death of such an individual as though he were a common criminal did not make sense to the masses. The idea of a resurrection, connected as it was to already existing pagan thought, was much easier to accept. And so today, Easter is one of the two primary Christian festivals. It is widely practiced, and few stop to question its origins. Moreover, most fail to ask the more important question: Do the Hebrew Scriptures and Apostolic Writings command a commemoration of Jesus Christ’s resurrection, or of His death on the Passover? An earlier version of this article appeared in the Spring 2000 issue of Vision. Revised and updated for Spring 2005.